Well, I decided to try out the Sliders Kevlar reinforced riding jeans and figured I'd do a review on them. Obviously, I haven't had the pleasure of skidding across the pavement on my *** in them yet (knock on wood), but if I do..... I have a feeling I'd rather be wearing these than regular jeans. The waist and length is true to size. I'd suggest ordering your correct size. The fit is loose and straight leg. (how I wear my regular jeans), so I like the feel of these. However, I will warn you that they ride kinda low. 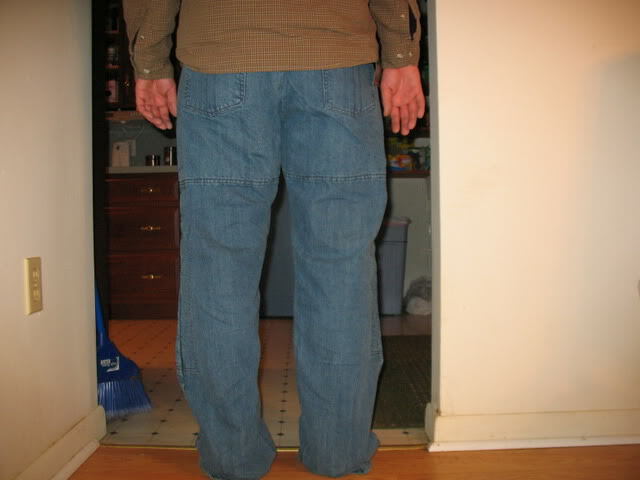 Not as bad as some jeans I've tried, but certainly not regular rise. Cool with me, as I like the option to show off my thongs. Big panels in the *** and knees, and pretty wide strips in the thighs. The kevlar is also covered on the inside with a soft cotton fabric, which is good because it doesn't feel scratchy. They feel slightly warmer than regular jeans, but not too bad. I snapped a couple quick pics while wearing them to give you an idea of how they really look vs. the "stock pics" on the website. 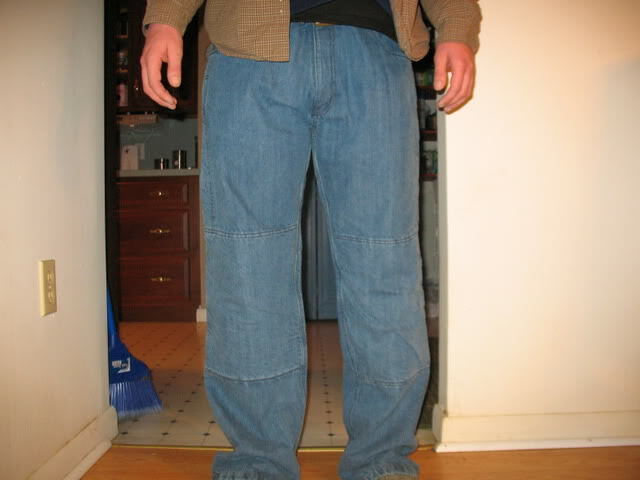 Some complained in other reviews that the "blue" color didn't really look like regular jeans. Looked fine to me.... they match many of my regular pairs. They're comfortable, I can wear them anywhere, and they have to be better protection than regular jeans. They cost about $80/pr shipped, which is cheaper than many other brands, and they appear to be well built (even the denim is thick). They're made with brand name Dupont Kevlar, which I think is good. (at least you know what you're getting). The stitching looks good, and everything is double or triple stitched. This was a little bit of a problem with me, and I ended up screaming at a supervisor. They say to "call for availability", which I did BEFORE ordering. The guy says "yeah, we just got a huge shipment and we'll be shipping them out in 2-3days max"
About 10days later, I get a backorder notice sent to my email. I call, and the guy says "We have them here, and you'll have them this week". So total wait was like 3wks, but could have been 6wks+. I've heard that Comp Accessories does this chit quite often with the sliders, so buy at your own risk. Other than that, pretty nice pants.